Hostels in Los Angeles offer a relatively inexpensive lodging option, especially for international travelers, students on a budget, and solo travelers looking to socialize. Hostel accommodations are very hit or miss, especially because they are often staffed by international travelers who only stay for a month or so. If you’re lucky you find a clean bed and friendly staff, if not, you find bed bugs and eccentric owners or rude employees. This can all be at the same establishment from month to month. Hostel bed prices have doubled in the last few years, so if you have two or more people, you may get a better bargain on a budget motel than two dorm beds, but you won't get the same party atmosphere. Many hostels also have private rooms available. Some hostels require membership. Many require a foreign passport, or an out-of-state driver’s license and current student ID, at least for dorm rooms. This is a good thing, as it decreases the chances of finding the local homeless population in residence using hotel vouchers. Hostels are required to charge the occupancy tax rate of the city where they are located, ranging from 10 to 15.5 percent. For some reason, many of them do not add the tax to the charge when you book the room online, but you are required to pay the tax when you check in. If you are looking for spotless rooms or a quiet night’s sleep, hostels may not be for you. If it’s all your budget can handle, pack your earplugs, keep a strict watch on your stuff, and bring a good attitude and an interest in making friends with other travelers. 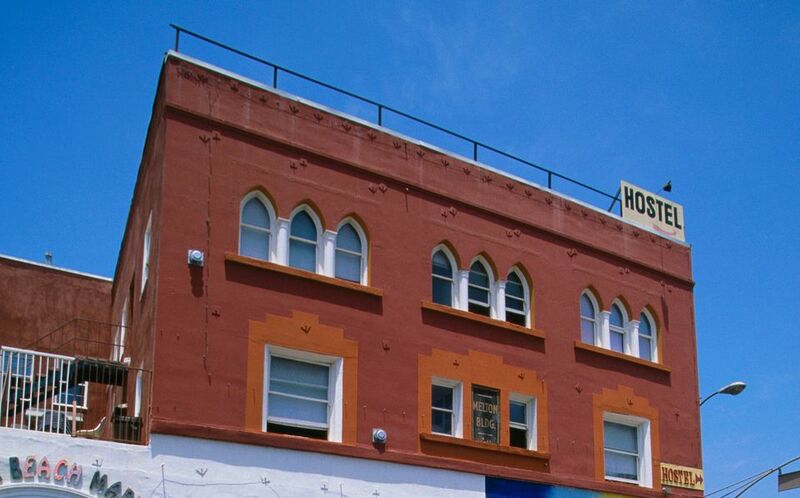 Here are the top hostels in Los Angeles. USA Hostel in Hollywood is not quite as central as some others, halfway between the Hollywood & Highland and Hollywood & Vine Metro Stations. It gets the highest ratings of all the LA hostels. Address: 1624 Schrader Blvd, Hollywood, CA 90028. Located on a side street near all Hollywood Blvd attractions. Check-in Criteria: International travelers 18 and older with valid foreign passport and proof of international travel, U.S college students with a current out of state college ID with a government issued id (driver's license, etc). Mixed dorms are reserved for couples or siblings traveling together. Couples must reserve two beds. Features: Guest kitchen, lounge with stage, garden patio, free cook-your-own pancake breakfasts, free linens, free lockers, free incoming phone calls, Internet access, free wireless access for laptops, onsite laundry, daily activities such as pub crawl, walking tours, bus tours, free beach shuttle, reimbursement for airport shuttle, no curfew. Orange Drive Manor is in a 1910 manor home centrally located just behind the Hollywood & Highland Center within walking distance of most Hollywood attractions. The property was once a boarding house for Hollywood actors like Marilyn Monroe, Gary Cooper, and Rita Hayworth. Located in a 1920’s manor house on a residential street near the Hollywood Walk of Fame and attractions. Check-in Criteria: No guests from Greater LA area. Proof of travel required. Features: Free breakfast, free WiFi, free lockers, free luggage storage, guest kitchen, onsite laundry, small common room with TV, patio BBQ, towel rental, no curfew. Note: children are allowed, but must be approved directly with the property. Banana Bungalow took over the old Vibe Hotel and brought back the dorm rooms as well as trying to offer everything a backpacker or hosteler might be looking for. There is also a Banana Bungalow in West Hollywood. Check-in Criteria: Proof of international travel required. Anyone under 18 must be accompanied by a parent or chaperone. Under 16 may not stay in dorm rooms. Features: Free parking, free Internet, free breakfast, free coffee, linen included, laundry, fitness center, air conditioning, weekly discounts, game room, basketball and BBQs, in-room kitchens, in-room cable, late checkout, TV, meals available, luggage storage, discounted tours, free Airport pick up with 4 nights paid. Hostelling International is a membership organization. Non-members can pay a daily temporary membership fee per day in addition to bed rates. Check-in Criteria: Guests must live outside of Los Angeles County. Under 18 must be accompanied by an adult. Maximum 14 nights per year. Features: 24-hour check-in, linens included, towels included, elevator/lift available, wheelchair accessible, kitchen, meals available, common rooms, outdoor terrace, steam room, laundry room, game room, Internet access, currency exchange on site or nearby. The Walk of Fame Hollywood Hostel, previously known as the Hollywood International Hostel, is right on Hollywood Boulevard in the heart of Hollywood. Check-in Criteria: International travelers 18 and older with valid foreign passport and proof of international travel. No children or pets allowed. Mixed dorms are reserved for couples or siblings traveling together. Couples must reserve two beds. Features: non-smoking hostel, common room, reading room & book, exchange, guest kitchen, breakfast included, 24-hour reception/check-in, no curfew/lockout, laundry on site, lockers, free Internet, discounted pick up from the airport, bus or train station, luggage storage, steam room. Surf City Hostel is located a block from the beach in Hermosa Beach between two bars that play loud music until 2 am, so it's a great location to party, but not so much if you want to go to bed early. Check-in Criteria: 18 and up, valid passport required. Features: Free breakfast, free WiFi, linen included, free bodyboards and volleyballs, kitchen, laundry, luggage storage, lockers, bike rental, surfboard rental, tour desk, card phones, free street parking nearby. Located in the Los Angeles port neighborhood of San Pedro, overlooking the Korean Friendship Bell and the coastal cliffs of the Palos Verdes Peninsula, this hostel in an old Army barracks is not too far from the LA Cruise Terminal, harbor tours, and other harbor attractions, but remote and inconvenient to most tourist areas of LA. If you're not planning on visiting San Pedro attractions, it may not be the best choice. Features: Free Sheets, kitchen, common rooms, laundry room, game room, Internet access, lockers available, playground, BBQ. Note: This is a seasonal hostel, operating from mid-June to mid-September. Available to groups of 20 or more in the offseason. This property doesn't get great reviews but they have the least expensive beds in town if you need to be near LAX. If you're going for a private room, you'd do better to try Priceline for a 2-star hotel near the airport. This location has two sections, the all-suites Adventurer Hotel, and the dorm-style Backpackers Paradise with 4-bed to 20-bed gender-specific and mixed dorm rooms. Features: free 24 hour airport shuttle, free shuttle from the Hawthorne Greenline Metro Station or LAX Transit Center, free gated parking, free WiFi, free dinner buffet with purchase of beverage, free breakfast is a blueberry muffin with tea or coffee, free cake and popcorn, free daily champagne, free daily trip to Manhattan Beach, cocktail bar, pool, room service. This information was accurate at the time of publication. Please check with the hostels for the most current information. The Venice Beach Cotel is part of the Samesun Backpacker Hostels chain. It is located right on the Venice Beach Boardwalk in a 2nd floor walk-up with ocean views from the common area and lots of group activities. Address: 25 Windward Avenue, Venice, CA 90291. Note: Valid passport required including for US citizens. No elevator. No parking.